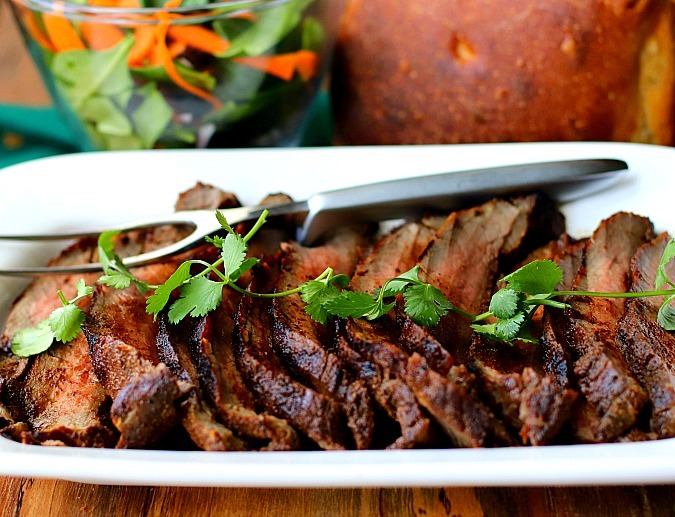 This coffee rubbed flank steak has such a smoky, rich, and delicious flavor. Along with coffee, the rub for this steak also includes garlic, pepper, brown sugar, cayenne, cloves, and cinnamon, along with salt and pepper. The combination of the flavors in the rub, married with the high heat on the grill or grill pan, creates an incredible flavor. I have been intrigued by idea of using coffee in a steak rub, and decided to try it out on my favorite cut of meat, a flank steak. 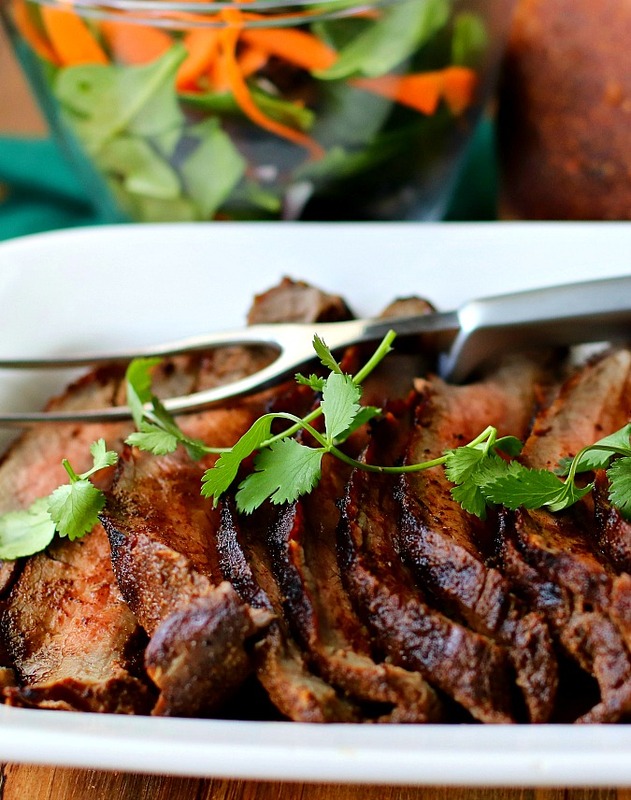 It's a lean flavorful steak that you can quickly and easily grill to medium rare, and serve. You will need to slice it thinly against the grain, but you will be rewarded with a delicious and reasonably priced steak dinner. I coated a three pound flank steak with this coffee-based rub and refrigerated it for about 6 hours before grilling. You can rub the steak just an hour before grilling, or even overnight. I served this steak with a spinach salad and freshly baked bread. It's also wonderful with seasoned rice and vegetables. We made some steak sandwiches with the leftovers, which we piled with caramelized onions, cilantro, and melted butter. So good. This recipe was adapted from Bewitching Kitchen written by my friend Sally, the brilliant research scientist who happens to have a very entertaining food blog (including puppies!). She used this rub in conjunction with the sous vide method on bison steaks! While Sally used finely ground coffee, I decided to try making the rub with espresso powder. I was so happy with the results! If you are hesitant about using coffee in your steak rub, I encourage you to give it a try. I can't wait to try it on other cuts of beef. Grilling time will vary depending on the temperature of your grill, grill pan, or cast iron pan. I use an instant read thermometer to determine when the steak is ready. Mix the rub ingredients and spread it over both sides of the flank steak. Cover and refrigerate for at least an hour, and up to 12 hours. Grill the steak to medium rare, about 5 minutes a side, until the interior of the steak reaches 129 degrees F. on an instant read thermometer. Move the steak to a cutting board and tent with foil. Let rest for 10 to 15 minutes. Thinly slice the steak against the grain on a diagonal and serve. Welcome to Progressive Eats, our virtual version of a Progressive Dinner Party. Each recipe in our menu this month features coffee in some form: espresso granules, coffee grounds, brewed coffee, coffee extract, etc. Our host this month is Coleen from The Redhead Baker. If you're unfamiliar with the concept, a progressive dinner involves going from house to house, enjoying a different course at each location. With Progressive Eats, a theme is chosen each month, members share recipes suitable for a delicious meal or party, and you can hop from blog to blog to check them out. Welcome to the club Karen! 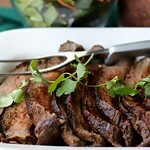 This flank steak looks heavenly and will definitely be showing up on my dinner table soon!! Thank you. It really surprised me. and so the Happy Dance, Extended Version, is taking place in the Bewitching Kitchen! I must use espresso powder next time - your picture looks AMAZING! It is a great recipe!! I used the whole recipe on the flank steak, and loved every bite!